When I first started kayaking, in those spare moments when I wasn’t actually on the water I eagerly read every kayaking book I could lay my hands on. And this book was one that all experienced paddlers recommended. Possibly they were tired of explaining afresh to each clueless newbie all the things that could go wrong. This book does that job soberingly well. Sea Kayaker’s Deep Trouble offers more than twenty harrowing, real-life accounts of sea kayaking accidents that will both keep you on the edge of your seat and instruct you with potentially life-saving lessons. These tales, drawn from Sea Kayaker magazine, are the result of interviews with accident survivors, witnesses, and rescuers. From capsizes and hypothermia to brushes with sharks and entrapment in sea caves, the situations are described in chilling detail and then subjected to expert analysis: … What did the paddlers do wrong? What did they do right? Most importantly, how might the accident have been prevented? With a comprehensive introduction to kayaking safety and three dozen sidebars on gear, skills, and techniques, this book is a must for any sea kayaker who wants to paddle safely. At first glance, the accident scenarios are diverse. Exposed crossings, the open coast, sudden fierce wind, fog, strong currents and tide rips, unmanageable surf, turbulent river bars, narrow sea caves, ice fall from an overhanging glacier, shark attack. Nevertheless, a certain monotony creeps in. The same root causes repeat over and over. The paddlers are generally unprepared and inexperienced. (However, several chapters make it clear how even experts can get into trouble, especially when they must look after less experienced paddlers. One chapter features Eric Soares, the Tsunami Ranger who sadly died this year.) The paddlers are capsized by wind or in a tide rip. From that point on the situation steadily deteriorates. The paddlers can’t rescue themselves, or, if they do, they are merely back in the conditions that capsized them in the first place. They capsize again. They lose equipment or even their boats. And then hypothermia does them in. In most of the chapters in the book, this sequence was interrupted by external rescue at the last moment—otherwise there would be no-one left to tell the instructive tale. But there are a few chapters where rescue did not come in time. These chapters are much shorter. 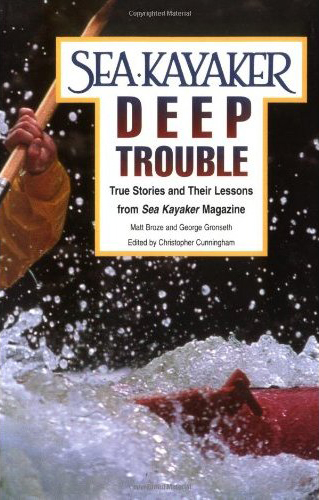 Possibly because there are only so many times that the same basic story can be told, there’s been no sequel to this book, even though Sea Kayaker has continued to publish these “Safety” stories. The stories in this book are all from the early years of the magazine. It’s striking how many of the stories are from the Pacific Northwest—the Washington coast, the San Juan Islands, British Columbia (and also Alaska). As the Introduction explains, “This is not because the region is kayaking’s Bermuda Triangle.” Rather, it’s a region with a long history of recreational kayaking, and so kayaking accidents, and furthermore a region that combines beautiful, accessible marine scenery that attracts all manner of paddlers with strong currents and winds that can easily overwhelm those who are unprepared. Among all these chapters that feature unspoilt natural beauty and natural paddling hazards, one chapter stands out like a sore thumb. It’s entitled “The Phantom Barge,” by Alison Armstrong. It’s a gritty tale of urban paddling, and its hazards, from our very own New York City. It’s also by far the best-told story in the book—even though I think poetic license must be granted to some of its more colorful details—and I can’t resist retelling it here largely in its own words. In the late afternoon of July 3 (perhaps not the best day in the year for such a trip), 1990, Alison and her friend Ken set sail in their double folding kayak equipped with a sail rig from the old Downtown Boathouse on Pier 26 up the Hudson River. “Everything became very still except for … the occasional burst of fireworks over Manhattan.” It was after midnight, and they were exactly in mid-river. The kayak was wrecked, full of water, but afloat (a folding kayak!). They got astride it. Ken was bleeding from a head wound. But, although it may not have seemed so at the time, the worst was over. The story now veers increasingly toward the kind of grim comedy that is familiar to all living in the big city. The Coast Guard, contacted over the radio, “responded that their presence was not necessary since no one was killed and ‘only’ a kayak was involved.” So their rescuers took Alison and Ken, with the kayak in tow, to a marina in Weehawken, on the New Jersey side of the river, where paramedics were waiting for them. To any New York City kayaker, this will all seem quite familiar. Certainly I’ve done my share of night kayak sailing on the Hudson, and then Johna and I had that little adventure in Brooklyn last year… This story injects a welcome note of comedy into an otherwise sober book. So if you are a kayaker—especially a beginning kayaker—buy this book! Quite apart from the entertainment value, the examples of what not to do and how not to do it, the safety information, and the practical advice contained in this book might just one day save your life. This entry was posted in Book Reviews, Kayaking, New York City and tagged Accidents, Alaska, Book Review, Kayak Safety, Kayaking, Pacific Northwest, Sea Kayaker Magazine, Sea Kayaking. Bookmark the permalink. Thanks for the recommendation. I’m hoping to get into adventure racing this year and that will involve me taking up kayaking again (I used to kayak before my partner started working weekends and I lost the use of our car on my days off). I’m going to start back by doing a few kayaking tours and also hiring boats in relatively safe local waters (no waves). Might order a copy of this book when I have some funds available so that I can learn some more before I start to really venture out on my own (that won’t really happen until I get a trailer built so that I can tow a kayak with my motorbike). True..TRue..and TRUE! Read this book. It was well known ten years ago, but since then has largely disappeared from sight. Time to bring it back! PS – Always dress for the water temperature. Yes, the usual suspects appear with depressing regularity, and cold water is a major factor in the majority of them. I think there’s a silver lining, however: because the primary causes are so often the same, if we can get a handful of safety points across, we can reduce the majority of incidents. Great post, by the way! Thanks! And thanks for your comments! Cautionary tales are incredibly potent for those who listen . . . We just had a student die in a motorcycle accident last week. He sold his bass guitar for a motorcycle (first mistake) and then was full of “pep” on a warm day and made a fatal mistake, while not wearing a protective helmet. Thanks for the great reminder post, Vlad. Of course, anything can happen at any time but it is good to be appropriately apprised of possible problems. . .
That’s it in a nutshell, Vlad. In mountaineering, we used to call those little blue windows in the clouds “sucker holes”. Warm day, cold water, same deal. Good to keep beating the drum, though; you can never tell, when you plant that tiny acorn of knowledge, how big the oak will grow, or if it’ll take root at all. I figure you saved some lives with this timely post. Impossible to read Deep Trouble & hang onto that cocksure, invulnerability attitude. Well, maybe not impossible, but damn hard. Good job, mate. I’ve only been sea kayaking once – it was a very calm and friendly paddle…nothing out of the ordinary at all – yet I thought I was living on the edge! I can’t imagine these kinds of conditions! But I’d do it again!! But seriously, you can always experience that feeling of living on the edge, while still remaining (relatively) safe, no matter what your skill level is—when you first start out kayaking, you can experience it in little six-inch waves… One of the great things about kayaking! In the PNW, I’ve ever heard of illegal unlit barges. Thanks for posting. The shipping lanes around Bellingham and Seattle would be terrible for paddling. Most people avoid them. The complex inlets and islands up here make for weird, unpredictable, changing currents i unexpected places. 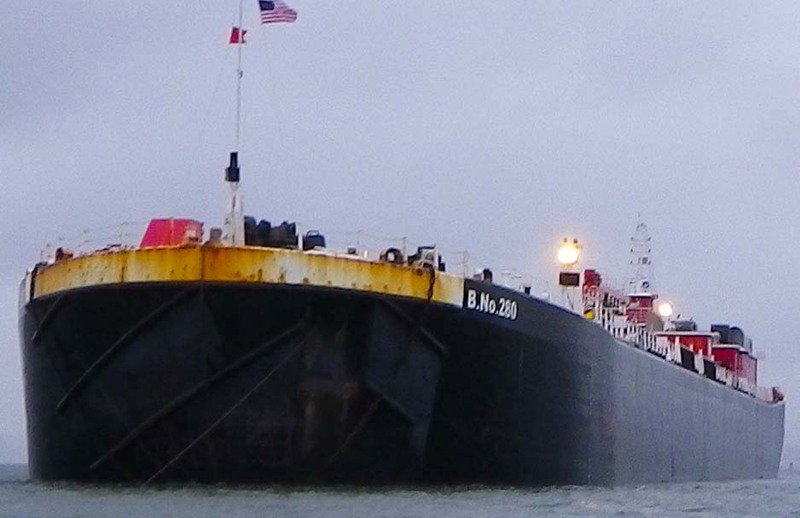 The absence of breakers can lull seakayakers into a false sense of security.